Out of nowhere circumstances arise that will either set you back, or simply shift everything in your life. You did not see it coming so you feel totally unprepared. It could be anything from an unfavorable doctor’s report during a routine annual check-up, or termination of employment after years of commendations and faithful service. While you would like to discover a deep complex reason, more often than not it’s just life, and life happens to us all. Whether it’s in your health, your family, or in your finances, at some point we will all go through storms. Storms that make you want to condemn yourself, or blame the devil. Storms so severe, that you want to hide from the embarrassment of loss. You’re left feeling that you are the only one caught in the cyclone of setbacks. Most believers have become especially adept at putting on a spiritual face to cover up what we perceive as failures or vulnerabilities. Please allow me to fill you in on something; it is not uncommon to love the Lord and still deal with depression, disappointment, and defeat. Before you fall into despair, remember 1 Corinthians 10:13 also says, …but God is faithful. He knows your frame and He knows just how much you can bear. And just when you feel you can’t face another day, He graciously extends a supernatural strength to withstand and overcome the obstacles and opposition life may bring. I can’t tell you how many times I just kept moving because God was faithful, even when I wasn’t. When I failed, when I disappointed Him, when I messed up, He still loved me. He loved me in my unfaithfulness and in my disobedience. Believe me when I tell you everything has the potential to fail you, but God. He is the same yesterday, today, and forevermore and His Word will come to pass. Remember You are fit for the Fight! 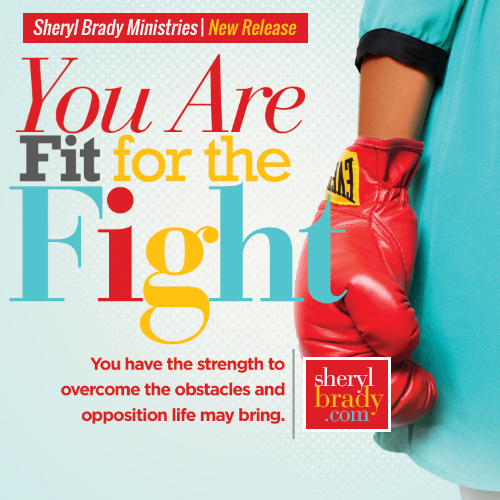 Don’t fret and don’t give in, God has already equipped you with everything you need to win.